The online casino DublinBet has a long history in the market of gambling on the Internet. In fact, it was launched in 2004, and continues to offer their services to players ever since. Such longevity is very welcome, as it is not the norm in the casino industry. An explanation is the trustworthiness and the professionalism of this online casino, as well as their original services. In fact, DublinBet offers you the possibility to engage in live streaming games from a real brick and mortar casino, the famous Fitzwilliam Card Club in Dublin, Ireland. You can find out more about this brilliant operator below. It has now been over 10 years that DublinBet had been offering their range of online games. Naturally, the online casino also changed over the years. The design was not always as it is now. Today, the layout and design of the casino is more modern than it was before. Although it is not something exceptional, we would like to point out that the website loads smoothly and fast. However, we have one small complaint, and that is the link text for the Terms and Conditions at the bottom of the home page. It is written in grey in a small font, and it is not easy to read. The online casino can be visited without the need to download a software. It uses the Java technology, and you can play the games directly from any web browser, without having to download or install a software on the hard drive of your computer. The casino also has a nice mobile version that currently offers over 300 games. Speaking of games, this is what changed most in the casino. You can find out more about this important part of the casino in the next paragraph. When it first appeared on the Internet in 2004, DublinBet offered a completely new concept of gaming, as it offered the players the chance to take part in multiple live games directly streamed from a renowned land-based establishment: the famous Fitzwilliam Card Club in Dublin, Ireland. Although many casinos offer live casinos today, it was a real revolution at that time. In any case, playing these types of games is always nice. Some players are maybe put off by the pace of the games, as they are a lot slower than online counterparts, but the atmosphere reminds of playing at one of the biggest casinos in the world. In addition to these attractive live games, you can also find a huge game selection of over 300 games from prestigious developers, such as Netent and Betsoft, among others, as well as some lesser-known developers, such as Actual Gaming, Play'n GO and Yggdrasil Gaming. Other games (22 games with scratch cards, keno, and an excellent 3D virtual horse racing game). Unfortunately, there are not many progressive jackpots and they also do not have a very high jackpot either. We also did not find a tool to help you find your way around the many games. A filter system would have been handy to sort through the games. The game selection at DublinBet is very attractive, as it offers both live games that let you enjoy the unique atmosphere of the classic casino games, and also some of the best slot machines on the market, such as the cult game Gonzo's Quest from Netent or the entertaining interactive video slot WhoSpunIt? from the developer Betsoft. The promotions at DublinBet are not particularly generous, as these offers do not really allow to get a lot of money, and they also have relatively strict bonus conditions. The welcome bonus is 100% up to 100€/$/£ on your first deposit into your player account. You will have to wager a total of 30 times your bonus amount plus your deposit before you can withdraw your winnings from this bonus. After the welcome bonus you can make use of other promotions, such as for example Happy Hour bonuses, reload bonuses, free spins on certain days of the week, slot tournaments, missions with prizes, and there are also many promotions that regularly change. DublinBet also offers you the opportunity to collect SuperPoints through various daily activities, such as connecting, depositing, withdrawing, playing and winning for example. You can then spend your Superpoints in a dedicated shop on all kinds of gifts, such as free spins, bonuses on deposits or even real money. DublinBet has a licence from the government of the Netherlands Antilles (Curaçao), and managed to attract and retain many players over all the years of their operation. The reason for this is their seriousness, trustworthiness and professionalism. These qualities are also found in the customer service that is accessible 24 hours, 7 days a week. The support can be contacted by email and live chat. The operators of the support are efficient and friendly. They also offer support in multiple languages. Simply ask them. In addition, on another positive note, assistance is also available when you are playing a game, which means that you can ask all the questions you want, while continuing to play your games. The minimum deposit is 10 €/$/£ and withdrawals have to be between 20 and 1,000 €/$/£ per day. We must admit, that this maximum limit is unfortunately very strict. In conclusion, we can say that DublinBet is not the perfect online casino but let us remember that perfection is not really part of this world. There are only a few flaws, such as the small progressive jackpots and low maximum withdrawals, but it is mostly the strict conditions of the promotions that might be a bit off-putting. However, these limits are balanced out with other enormous qualities, for example the professionalism of the operator and the selection of top games. In short, DublinBet is a very attractive online casino with many qualities, and we suggest you discover the casino for yourself. The old format Dublinbet was better for live roulette, which is what I play.Still waiting for a payout after 2 days, so make sure you're not n a hurry for the fundsAs per other feedback, they likely take so long so that punters change their mind and cancel the withdraw. One of the trustable" online Casinos.Don´t be stupid you can always lose your money at ANY Casino!But when you play at Dublin Bet you don´t get the feeling that they try to make you lose. No strange delays in their system that fucks up your bets.No strange delays in their pay out system . They are slower than most Casinos but they always pay.I have been playing Baccarat at Dublin Bet for more than a year and I think they are one of the best online Casinos!" I recently visited Dublin and went to the Fitzwilliam casino. 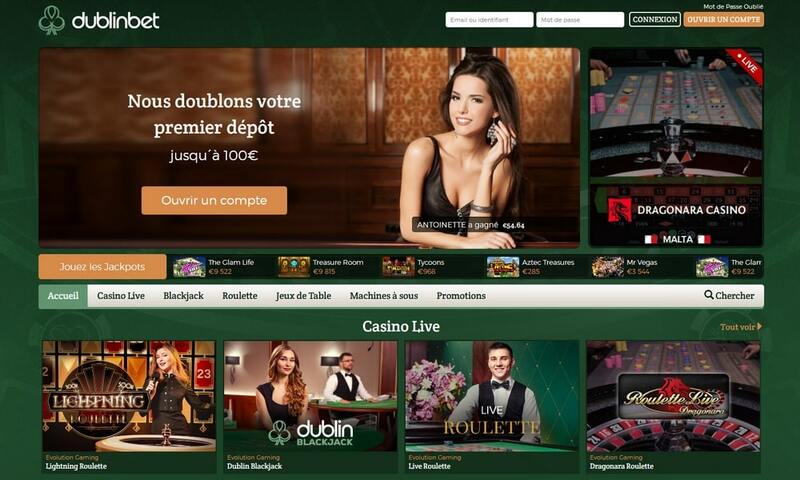 i really liked it there, and then the dealer told me that I can also visit the casino online through the live casino of Dublinbet. I really wanted to try this out and when I got home i even found the same dealer at the table that I was playing with before in the real casino. I really like the atmosphere of the live casino, my favourite game is blackjack. The friendly live casino is a great touch to the rest of the online casino, which I also quite like. whenever I have a question, i can contact the support and they help me. I never had any issues playing there. Dublinbet has a solid offer with the netent and betsoft games. i really like betsoft and the stories that all the games are telling you. the graphics are just brilliant! overall, the casino is very good, but they have the pending time for withdrawals which i dont like very much. but so far they have always paid me, and never withheld anything. i never play with bonuses, and since this casino doesn't offer a whole lot, it's not a problem for me. it's a good casino if you are looking for netent and betsoft slots. the game selection is fantastic, but a drawback is the long pending time for withdrawals. they do pay, but you just have to wait a bit. otherwise i didn't have any problems with the site and its fun to play there. the welcome bonus is a bit weak, dont expect a lot. 3 stars for the long withdrawal time, otherwise would have been 4.